We’ve heard for decades that socialism has a body count. But how does it compare to capitalism? Mike Davis discusses Stalin, Mao, and the staggering holocausts of capitalism’s nineteenth-century heyday. The Chinese government sending officials to the countryside during the Great Leap Forward. Wikimedia Commons. This summer’s electoral wave gave the US socialist left a much larger audience than we’re used to. Not only did we gain an extraordinarily wide hearing for our political ideas, but we also spooked our ideological opponents, and as a result got a good look at their rhetorical arsenal. Many of their arguments are familiar. For decades, one of the most popular methods of undermining socialists has been an appeal to the atrocities that occurred in Stalin’s Russia and Mao’s China. Horrifying episodes like the Great Chinese Famine and the Soviet famine under Stalin are brandished as proof that socialism can never work and is too dangerous to attempt, so we’re better off with capitalism. Mike Davis’s book Late Victorian Holocausts complicates that story significantly. Capitalism has an enormous death toll of its own. If famines are the yardstick we’re using to measure the suitability of a global economic system, then capitalists have a lot to answer for. Jacobin’s Meagan Day talked with Davis about how the historical crimes of capitalism differ from those of socialism, and how to talk about the differences between them in an era of ever-more savage capitalism — as well as new openings for the socialist left. Tell me about the Indian famines of the 1870s. The incorporation of the great subsistence peasantries of South and East Asia was absolutely cataclysmic. The story differed from place to place, but the final death toll was enormous. India is the most dramatic example, in part because it occurred on the watch of British liberalism. By the 1870s, the British had sponsored a great deal of development in India of canals and railroads designed to move export products from interior agricultural regions to the coast. They’d also pioneered large-scale irrigation to raise cotton, something that became urgent during the US Civil War and its resulting cotton famine. The British claimed that because of the railroads, it would be impossible to have famines in India anymore. And in the past, India had severe famines, though like China, there was never a famine that wasn’t compensated in a sense by good crops from another part of the country. So the British said, now that we have railroads, we’ll of course move grain from grain surplus regions to the regions affected by drought or flood. What in fact happened in 1876, when you had two monsoon failures in a row and famines in Western and Southern India, was that the railroads were used to take grain out of the famine regions. Because the domestic grain market had been largely privatized, grain merchants pulled grain out of the famine regions and stocked it in railroad centers to wait for the prices to rise and make a killing off of it. On the village and town level, centuries of fighting drought had led to local water storage systems, small reservoirs and the like, which were managed through the paternalistic relations of the village, with the local nobility of different kinds responsible for the upkeep. So under the Mughal Dynasty [1526-1857], though famines occurred, there was nothing on the gigantic scale of the nineteenth century. When the British came, they ignored local water storage entirely. They of course displaced much of the local nobility, and merchants and moneylenders often became the power on the village level, buying grain and export crops cheap to sell dear. When the famines came, they were more apt to try to profiteer in grain than relieve the starving peasantry. Coupled with this was the fanatical, dogmatic British belief that whatever happened shouldn’t interfere with the operation of the market. The market should work to ultimately relieve the famine. It was the same policy they had applied in Ireland in the 1840s, which had led directly to the starvation and death of about a fifth of the Irish population. At a time when Ireland was exporting things like cattle and horses, people in the west of Ireland were reduced to cannibalism. It was only reluctantly, and because of radical critics inside the British administration in India, that relief was provided, where you worked in order to be fed. But they chose the most grueling system of all, which was to require people to walk to the relief sites, which were generally railroad construction or canal digging projects requiring heavy labor. People were compelled to walk twenty-five, thirty, sometimes forty miles from their homes, and people died like flies at the construction sites and along the way. They were already badly malnourished, and the expectation that they could walk this great distance and then undertake heavy labor simply doomed people. It was very similar to systems of coerced or forced labor in African colonies, or what the Germans practiced during World War II, where they literally worked people to death, Jewish people and many others. And then on top of that you had the fact of India’s role in the British Empire — it was absolutely crucial to the British nineteenth-century economy. Britain ran a trade deficit in other parts of the world, but made up for it in Indian exports. India also paid for the Indian Army, which allowed the British to send large bodies of troops into Asia, Africa, and eventually, during World War I, to Europe itself, without having to maintain a large army. The British professional army was very small. It was India that provided the crucial edge. So this was a form of taxation, revenue taken out of the villages, and there was no compensation in the form of investment in local water storage, farm tools, or in education. Contrast this to Thailand, which actually invested fairly impressively in elementary education in the same period — one of the things that allowed it to escape colonialism. So the combination of all these things — private grain market, a reluctant and eventually destructive system of outdoor relief, and the fact that the villages no longer possessed the same infrastructure or resources — led to a famine that grew out of a drought, which ended up killing somewhere between eight and twelve million people. And then the same thing was repeated in the late 1890s, on a scale that was as large or larger than the first. Nathaniel Hawthorne’s son was one of the American reporters on the scene. He gave very detailed accounts of how British policy, its reliance on markets and its reluctance to relieve people by simply rushing food to the sites where people were starving, again doomed millions of people. Due to the famines in the 1870s and the 1890s, population growth slowed so much in some regions that it didn’t recover until Independence in 1948, after World War II. India’s always depicted as a teeming country, but these were very large-scale disasters. Regionally they were equivalent in terms of population loss and destruction of productive resources to the era of the Black Death in Medieval Europe, or even to the Mongol invasions. But they occurred on the watch and through the deliberate policies of the most powerful industrial nation in modernity. Modernization, which Indians paid for with their own taxes, did little or nothing for ordinary Indians. In fact it had the perverse effect of abetting a speculative market in grain, converting an environmental event into a famine that caused mass death. The same environmental event, a fluctuation of winds and surface temperatures on the Pacific Ocean known as El Niño, led to a famine in China at the same time, starting in 1876. This famine also killed millions, in the same amount of time and in a smaller geographical area. Late Victorian Holocausts includes some chilling descriptions of this famine. For example, starvation naturally caused Chinese people to steal out of desperation; authorities locked these famished thieves inside “sorrow cages,” where they were slowly starved to death. Emaciated people would lay down and be eaten alive by dogs. Human meat was sold openly in the streets. Parents would exchange children with another hungry couple, because neither could bear to kill and eat their own. What happened to cause this famine? China was absolutely exceptional in the eighteenth century. Not only was it the largest society on earth, but it was really the only society in which peasants’ right to life was more or less guaranteed by the state. China, like India, always had one area in grain surplus while another was in grain deficit. Southern China is often the victim of floods, but most of the environmental problems in China are concentrated in the North, in the basin of the Yellow River. So to deal with this disparity, the Chinese had built something which took probably even more people hours to construct than the Great Wall, and that’s the Grand Canal. The Grand Canal connected Central China, the Yangtze, to Northern China, the Yellow River basin. And it meant that in times of hardship in the North, rice could be shipped from the South to the North. And if the South was having problems, millet and wheat could be shipped from the North to the South. In the eighteenth century, this stopped several very large-scale droughts from turning into famines with potential victims in the millions by moving grain. The Chinese did the opposite of the British in India. Where the British made starving people walk for miles to work sites, the Chinese insisted that everybody stay at home, and they had a sophisticated system of relieving people where they were, with no requirement for work. Secondly, every county in China had a grain storage depot. One of the most important duties of the local mandarin was to keep the granaries full, and to prevent grain from being stolen or sold and so on. Chinese granaries were so impressive that, centuries later during the American New Deal, Roosevelt’s vice president Henry Wallace proposed the idea of an “ever-normal granary” inspired by the Chinese system. Overall, China in the eighteenth century had the most effective civil service in the world. It was unique in its capacity to deal with large-sale environmental events and to relieve famine. In European countries, this was not the case at all. At the beginning of the eighteenth century a couple million Frenchmen starved to death, and the state was almost entirely passive. And in the 1840s, of course, the Irish starved despite abundant grain resources that could’ve been used to relieve it. So China was quite exceptional. But things began to change with the Opium Wars, the extraction of concessions from China by European countries. The system began to fragment. Local mandarins frequently became corrupt and sold off the granaries. China in the 1860s experienced three civil wars, the largest of which — the Taiping Rebellion — is probably the bloodiest in world history. China was thrown into an immense crisis, and one of the casualties of the crisis was the maintenance of the Grand Canal. Rebels took over parts of it, and basically you had pirates on the Grand Canal. The granary stocks began to disappear. The impact of imperialism on China contributed centrally to the disintegration of the state capacities and the infrastructures and policies that had so dramatically, almost spectacularly relieved famine in the eighteenth century. The death toll was particularly concentrated in the Southern provinces of Northern China, which suffered an almost complete absence of rainfall. They were difficult regions to access. Immediately after the drought commenced, it was discovered that the granaries were empty. In some counties it became literally an extinction event. We’re talking about the starvation to death of upwards of three-quarters, and even 90 percent of the population in some counties. Normally in famines, whole populations will move, but in this case people were so weakened, and anything within a conceivable walking distance was also famine-impacted, that they had no choice. They were basically imprisoned, and began to die like flies. As with India, there was another famine in China in the 1890s. Again, in that part of China, population did not recover to its pre-famine level until the Chinese Revolution. Studies have shown that part of the reason the Chinese peasantry ended up supporting and joining the communists was that the warlord states, and the unified national government that followed, showed themselves totally incapable of managing environmental extremes. Controlling rivers and moving grain had become a kind of hallmark of the legitimacy of governments and dynasties in China. There was again a terrible famine in the midst of World War II. The communists were very active in combating it, which won them respect and legitimacy. So when in 1949 the People’s Republic was established, it enjoyed a very broad base of support — not only for its opposition to the Japanese, not only for its proposed land reforms, but also because it promised to end famine forever in China. This was the mandate of the People’s Republic. And what happened at the end of the 1950s was not in any sense a deliberate attempt to starve a class or a region, as may have been partially the case with Stalin in the Ukraine. But it was absolutely criminal nonetheless. One of the top Chinese generals was deposed when he dared to confront Mao about the famine in the Central Committee. Mao apparently denied that there was any famine at all. That falls within the realm of criminal responsibility, in the same way that the British were criminally responsible for the famines of the 1870s and 1890s. How did the global spread of capitalism exacerbate famine and war? Marx covered that most eloquently in his section on primitive accumulation in Volume I of Capital. The foundations of capitalism are slavery, colonialism, the confiscation or appropriation of the individual property and communal lands of the European peasantry, the extinction of native peoples in order to open up new areas for global grain production, and so on. In the 1870s, after Marx, there occurred the final defeat of the Plains Indians in the United States, which suddenly made available these enormous grasslands for the cultivation of wheat. And they only occurred at the expense of the annihilation of native people. Almost every stage in the growth of this system has involved some process of violent expropriation, forced labor, displacement. Not to mention the fact that the creation of unparalleled forms of wealth in the industrial revolution went hand in hand with the pauperization of factory workers and the creation of these deadly industrial cities where people died from tuberculosis and from work-related diseases. Now, there’s a famous debate among socialists as to whether primitive accumulation is integral or constitutive of modern capitalism itself. Some denied it, thought it was just a bloody preface to capitalism. But Rosa Luxemburg in her masterpiece The Accumulation of Capital insisted that primitive accumulation is integral and it has to continue opening and creating new markets and new sources of labor. Among contemporary thinkers, David Harvey shares Luxemburg’s position. In any case we have to acknowledge the continued role of forced and unfree labor in the capitalist world system. The belief that all this kind of ended with the emancipation of slaves in the western hemisphere is totally wrongheaded. The second issue under consideration is war. There’s always been the debate over whether war is necessary to the reproduction of the world market. Some people saw the end of history twenty, twenty-five years ago and said, “No, it really isn’t, we’re past all that, look at the European Union.” Well, the verdict would seem to fall the other way. The wars of the twentieth century were generated by competitions over markets and resources, fueled by many other factors as well. World War I may have started almost by accident, but all the conditions for a collision of the powers were already there, and many people already knew that war was inevitable because of the demand for lands and markets and the control of commerce — this competition occurring at the end of the period in which the British has been hegemonic in the global economy. So all of these processes — the original expropriation of agriculturalists, the incorporation of the great non-European peasantries into the global system, industrial economies initially based on levels of exploitation that not only robbed people of opportunities for culture or social life but destroyed them through overwork and disease, massive imperial wars, and then of course the legacy of all of this which is a position of dependency from which many colonial economies have never recovered — these are all systemic violence. Things like the famine in the Ukraine, the purges in the Soviet Union in 1937-8, the Great Leap Forward Famine, and the Khmer Rouge are political crimes. And of course many socialists would dispute that they occurred under socialism at all. Stalinism was a kind of Thermidorian reaction that ended up costing the lives of perhaps as many communists as Hitler killed in Central and Eastern Europe. There is systemic and unavoidable violence built into the world market and global capitalism. No one has built a socialist society — when we talk about Stalin’s Russia and Mao’s China we’re talking about societies in transition. But in these transitional societies there’s no similar systemic logic to violence; the logic is political. The logic concerns state power. There is one exception, and that exception is that in very undeveloped countries, there is really a contradiction between urban industrial development and the countryside. In the ruined society the Bolsheviks inherited, the peasants had little reason to produce food for the cities unless they got in return things they needed, especially the means of production they needed to make agriculture more productive. And that relationship broke down, and Stalin ultimately tackled it through using massive compulsion and violence. So you might say there is a systemic violence that’s inherent to transitional societies that mainly grows out of that contradiction. But more than that, in the specific historical case of the Soviet Union, the society was more or less destroyed by 1921 — after World War I, a civil war in which a million Red Army soldiers were killed, and famines and disease which killed millions more. Russia was a shell of itself. That was the justification that the Bolsheviks offered for staying in power at all costs. And when that happened, they were cut off from the path that had always been envisioned for the creation of a more just and egalitarian society. And of course the economic boycotts, the interventions, and the wars fought against the Soviet Union were also major factors in the internal violence and the metamorphosis of the regime into a dictatorship. China in some ways is more heartbreaking, because the revolution in my mind worked in the 1950s. Co-ops were obviously a way to go. 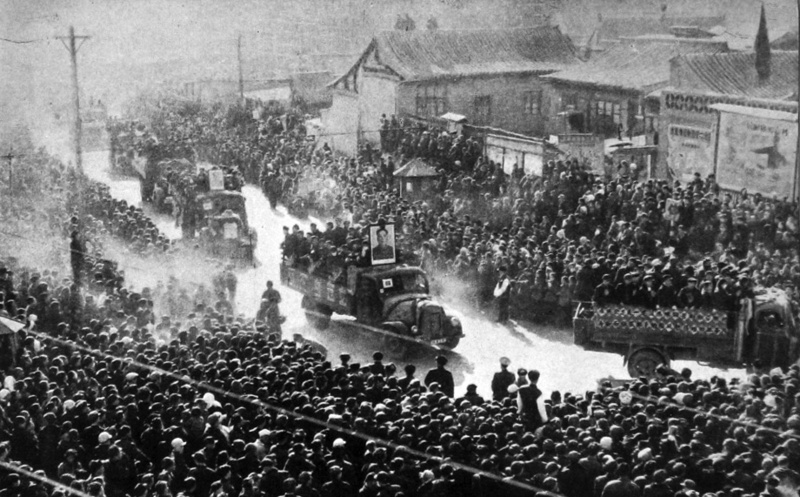 China, unlike the early Soviet Union, had a major industrial state to support it and aid it, namely the Soviet Union itself. And the Great Leap Forward Famine should have never occurred, least of all on the watch of people who’d come to power promising, among other things, to guarantee the right to life of rural Chinese people. There’s no way that can be expunged. It’s certainly the fault of Mao Tse-tung and the Chinese Communist Party. But whether that’s the fault of socialism is another question. Well, the response from ideological opponents of socialism would be that abuse of power is inevitable under socialism. And they will certainly admit to a degree of inevitable inequality and maybe even violence under capitalism. But for them the reason capitalism is superior to socialism is that they would prefer that inequality and systemic violence over abuse of political power. How should we respond to them? The equation between capitalism and democracy is tenuous at best. Liberal democracy is largely the product of the historic struggle of workers’ movements and movements for the franchise. Meanwhile the whole history of South America shows that capitalism more often than not is associated with dictatorship and oligarchical rule, not with democracy. So you have to question that equation fundamentally. Secondly, let me put it this way. So you’re Christians. Are you Catholics or Pentecostals? Do you support the Inquisition or nonviolent resistance? Socialism has so little definition that you have to go back to the position that I think the Democratic Socialists of America holds and is very eloquent about. You have to step back and ask, what is our tradition? We’re talking about socialist democracy. We’re talking about the necessity for the democratic allocation of resources, and democratic making of big economic decisions, which can only come about when large-scale social property is democratized and managed by society. Two of the most important points for socialists to emphasize are the systemic and unavoidable nature of political and economic violence in capitalist society, and secondly, to push back against the conflation of socialism with Stalinism and Maoism. In the United States there is almost a complete absence of knowledge about social democratic Northern Europe or, within the more revolutionary camp, the hundreds of thousands who died trying to prevent states that were founded by revolutionary struggle from turning into dictatorships. We need to point to the successes of socialism, including the advances made by social democrats. Whether it’s liberals or revolutionaries, the broad left has always been very bad about highlighting the gains of social democracy. As somebody from the far left, I understand the reasons for that. Social democracy sees economic inequality as the problem. Economic inequality is not the problem, it’s a reflection of the lack of any power within the macro-economy. Ultimately capital will find a way around social democracy. But nonetheless, this is a new era. We have a much more savage capitalism now. It changes the political parameters. What really has gained traction in the United States has been the advocacy by Bernie Sanders of a revival of the Economic Bill of Rights that Franklin D. Roosevelt tacked onto the end of his 1944 campaign. If you look at the program of the Sanders coalition, this is what they’re fighting for. Those are truly social democratic demands. They involve some degree of redistribution of wealth. I wouldn’t call them socialist or revolutionary because they don’t challenge economic power at its roots. It’s the basis on which the Democratic Party sought to renew in the 1940s and again in the mid-1960s. But once the New Deal was abandoned as the serious program of the Democratic Party, those demands for economic citizenship became far more radical demands. And they required far more radically minded constituencies to push for them than they had in the era when all of this seemed more compatible with the existing model of American capitalism and the social contract it had agreed to. Now you have a new kind of capitalism, and those demands have far more radical weight to them. And they’ve made it possible to once again talk about socialism — and to a large extent free it of the burden of the past, of the mis-association and misidentification of socialism with Stalinism, and with the abuse of political power. Mike Davis is the author of several books, including Planet of Slums and City of Quartz.